I have decided that I want to make some shade screens for the PH. They will go on the inside for a variety of reasons and I will be making them myself. At this point I am trying to decide on which material to go with, there are two contenders. Obviously, the more the shading the less visibility outside. For this reason I am not considering the Phifertex or Textiline mesh products that have 90% shading. I am concerned about not enough visibility when looking through them from the inside (or my wife is concerned). 1. How effective are they in cutting down the heat inside your boat. 2. How is the visibility looking out from the boat on a sunny day. If you could let me know what color of mesh fabric you have it would be helpful. Darker colors will absorb more heat, but will give better visibility looking through it. Is there a reason for being on the inside? I would wonder if exterior would be better so that the glass didn't heat up and generate heat into the boat after being removed. Yes and yes. I would prefer to put something on the outside, and may end up doing that some day, but until then I have to negotiate with she-who-must-be-obeyed. Which have you used, either of those or the Phifertex Plus or Textiline 90? I used Phifertex (came with boat when I bought it) and a friend had something very similar to the Texline, and perhaps that is what it was. I have been on several other Phifertex equipped boats as well. Not only is either hard to see out in direct sun (and impossible at night with any interior light), it is impossible for someone on the bow, say a line or anchor handler to see in. Since it was very easy to remove in a minute or two, no big deal. Both mounted on the outside by the way inside mounting would have been very awkward to handle. Yes, I have seen boats that left it on all the time when underway and it made me cringe. I am glad we had the screen. Thanks George. I am thinking of using it on the side windows while underway, but not on the forward windows. On of the reasons I am looking at the less shading options than the 90%, to get more visibility outside. Inside mounting on my boat would actually be pretty easy, but hardly ideal as far as heat reduction. The darker the color the better the visibility in daylight. The dark color reflects back less light. The lighter color would soak up heat less, but will reflect more light, reducing the ability to see through it from the inside. I disagree with George on point 2. Depending on the weave of the mesh, you can see out of them well enough to navigate. WHEN they are mounted on the outside of a window. If you're going to mount them on the inside, which I've done, not so much. If you're going to mount them on the insides of the windows consider useing suction cups to stick them to the glass so you can take them down quickly and easily. Plus you don't have to drive snaps into the wood work around the windows or run hook & loop tape everywhere. I recommend white and have always put it outside. I'd guess it somewhere in that same 70 - 80 shade value. They will send a sample if you request it. I don't think you'll beat or come close to the price of their seconds and honestly nothing major as far as defects that I've run across - buy a few extra Yds and look it ove / cut around anything that you might find. Ahhh...you need a wood magnet! I have exterior mounted screens (brand unknown) that I'd estimate at 70-75% light filtering. They're burgundy in color. Here's a picture I took this week from inside during mid-afternoon. Visibility is restricted, but usable in full sun IF DRY. Once they get wet, it's impossible to see through them. I've had to remove them underway for that reason. My current MO is to remove them before casting off, if possible...and if I remember. BTW, I never leave them on the windshield when underway....EVER! A minor digression, has anyone used dual lock fasteners such as 3M Extreme ? I just hate drilling holes in the gel coat for screwed- in snaps. Outside in my case. A minor digression, has anyone used dual lock fasteners such as 3M Extreme ? I use them to hold a Laminar Lip (screen extension) on my motorcycle. Well I suppose to each his own on what constitutes acceptable visibility. I need all I can get, and not just forward of the helm. I'd recommend getting swatches and seeing for oneself. The sun will hit from several different angles in the course of a cruise. Ours were on the windshield only as we had covered side decks and tinted windows. The PO installed similar protection on the outside. 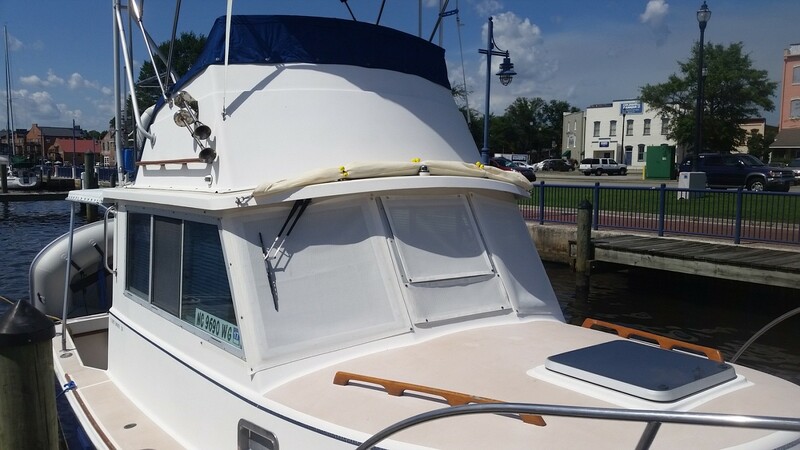 I feel it has saved the original plastic frame Windows and Lexan Windows on the boat. The Windows show NO crazing and the frames are in great shape. We have black Textilene mesh mounted outside our tinted front saloon windshield. Can't remember what % of shading, at least 80% and more likely 90%. It does a good job of cutting down the heat. We only mount it in the hottest months, though (usually July and August), because I like better visibility from within the saloon when weather is cool enough to allow that. Can't see out as much at night, other than lighted objects and building and so forth. People outside can see in, if our interior (saloon, etc.) lights are on. We've made Pfifertex in forest green and can be seen through easily. I wouldn't navigate in anything but broad daylight though. I think I just need to use the magic fastening system that has no snaps, no grommets, no Velcro, or no dual lock fasteners. If you want minimum fasteners - I'd say exterior and one piece windshield vs individual sections... I've done some that way for others / myself (previous boat)...by wrapping around the front / side sections it "self supports" to some degree needing many fewer attachments - Min probably top center on front and top + bot at the end of the side window - lots of times I start w/ the fewest and add if/where req'd. My "customers" are neighbors in my marina so I can respond to their inputs and desire to add easily - in this case "less is more"
Similar +/- inside vs outside - I'm assuming you have pretty good access to the inside of all your windows? or you wouldn't consider it - my current boat would be a pain to do inside. If you haven't already take a Look at the DIY Canvas Tips, Tricks, Recommendations You may find some tips helpful - if you have questions as you go post them there for all to benefit. We just made up some Phifertex screens... Very easy to do and sewable on a home machine. One fold, double stitch. The fronts seem to cut the temps at least 10 degrees and attenuates the sunlight nicely. My boat was like a terrarium without screens.. Visibility from the inside out is actually quite good and I'm tending to leave them in place as I generally drive from the bridge. Finished up the shades for the side windows this week and will install Friday. Luckily I was able to replace the side window fasteners with snap bases, so no drilling needed. Front snap mounts were already there for the previous sunbrella cover so no new holes. The whole project will be less than $200 including material (onlinefabrics.com), snaps, snap tool, polyester thread (Amazon, Sailrite)etc. Sewed this recently out of 90% Phifertex. It is replacing a solid white Stamoid cover that had seen better days. Let's in just the right amount of light and you can still see through it. My wife says it makes the salon less like a cave now. We really like it. Heat transfer is low. Really about the same as the solid original white cover. However we already had 3M film on the glass. You should get some samples that are big enough to tell what you think. Buy a yard of each. Then you will definitely know what you/she likes. Money well spent.